At one ERG breakfast meeting held on October 17 last year in Terrace Dining Room C in Westminster, Baker was in the audience alongside twenty ERG MPs. The agenda of the meeting was ‘Reporting Brexit’. 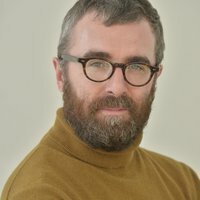 A senior political journalist from a pro-Brexit newspaper gave a brief speech about his perceptions of the Brexit process so far. This was followed by a question-and-answer session. Baker did not speak but was described as “quietly attentive” by one attendee. 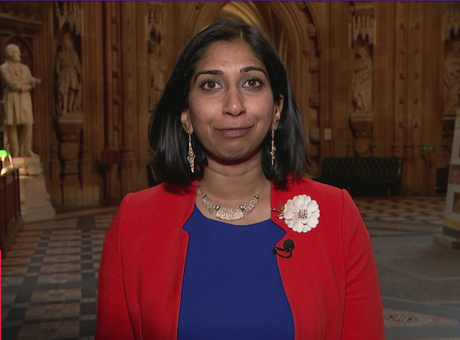 Also in attendance was Suella Braverman [née Fernandes] who chaired the ERG before being promoted in January this year to a ministerial role alongside Baker at DExEU. Braverman last year gave an embarrassing interview to Channel 4 News where she claimed the membership list of the ERG was publicly available, but then refused to give any details, effectively saying the make up of the ERG was known only to its members. Suella Fernandes. Image, Channel4, fair use. Within a few days of the ERG breakfast, there were renewed media reports that Theresa May needed to do more planning for a “no deal” Brexit. Of other events hosted by ERG over the last 18 months, DExEU would only confirm Baker had not attended as a “minister”. When Baker became a DExEu minister after the 2017 general election, the chair role was passed to Suella Braverman, an inexperienced MP. When she was promoted, Jacob Rees-Mogg took over. 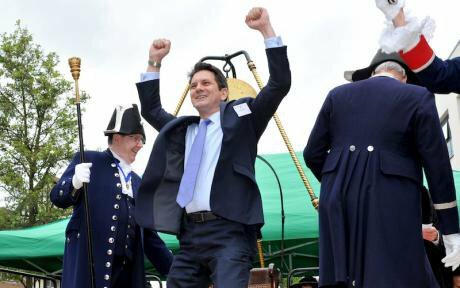 However, Baker is still regarded by many in the ERG as its behind-the-scenes driving force, with Rees-Mogg merely an effective public face. Ben Bradshaw, the former Culture Secretary in Gordon Brown’s Labour government, who has raised previous concerns about Baker, has written to Cabinet Secretary, Jeremy Heywood, and to the permanent secretary at DExEU, Philip Rycroft, for an explanation. Ministerial rules forbid membership of parliamentary groups, or the offer of formal support to pressure groups dependent on government funding. If a minister is discussing government business without an official being present, this has to be disclosed by their department. 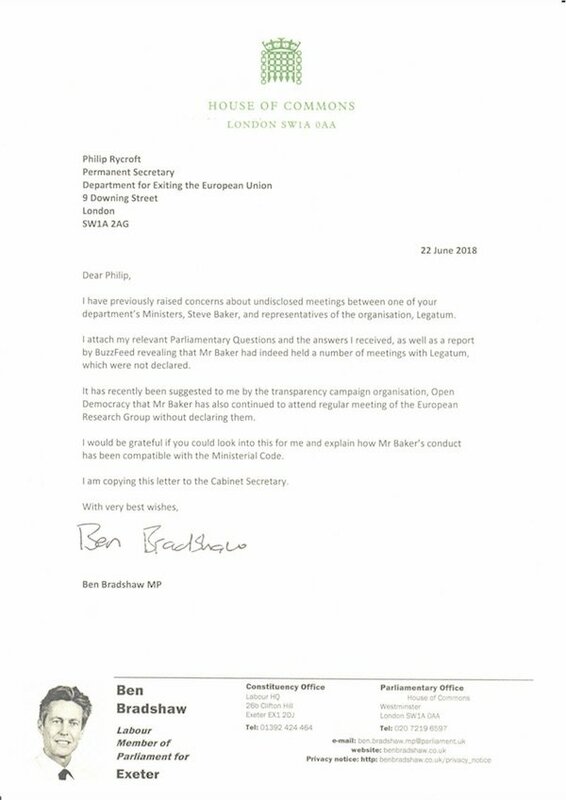 The Labour MP Ben Bradshaw's letter to Philip Rycroft, Permanent Secretary at the Department for Exiting the European Union.Last month it emerged that Baker held undisclosed meetings with Shankar Singham, the former Washington lobbyist who reinvented himself as a trade economist and until recently ran a trade unit at the Legatum Institute. Singham is now director of the international trade and competition unit at the Institute for Economic Affairs. He has said that a UK free of all trade ties with the EU could help boost the world economy by $2 trillion over the next 15 years. Many economists disagree. Despite transparency rules intended to reveal who Baker, as a minister, was talking to, Buzzfeed reported that Baker and Singham had a number of meetings at Legatum’s Mayfair offices. DExEU claim Baker and Singham have been friends since the Brexit referendum in 2016 and as such their meetings have been ‘social’ and therefore outside disclosure regulations. Baker is the only MP registered as having accepted a donation from the Constitutional Research Council, the shadowy group that gave the DUP’s Brexit campaign more than £425,000. 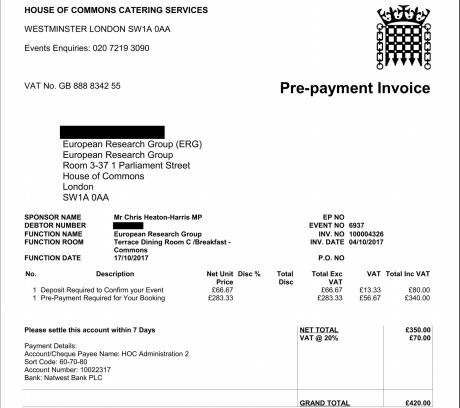 In December 2016, the CRC gave Baker £6,500 to “fund hospitality for ERG members and their staff” at a pre-Christmas event.